The holiday spirit is in full swing and as we make our lists and check them twice, we’re gearing up for more holiday parties! I don’t know about you, but with all of the different festive celebrations happening, we need multiple outfits. 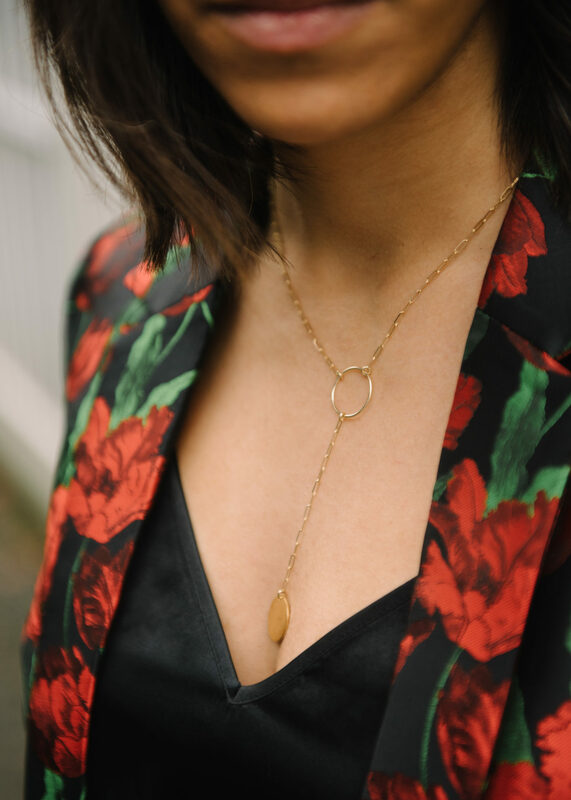 Whether you’re dressing for a get together with family, friends or co-workers, you’ll need an outfit that is party appropriate and my favorite, multi-functional (literally). Thanks to Park Royal Mall in West Vancouver I have my holiday outfit situation covered! 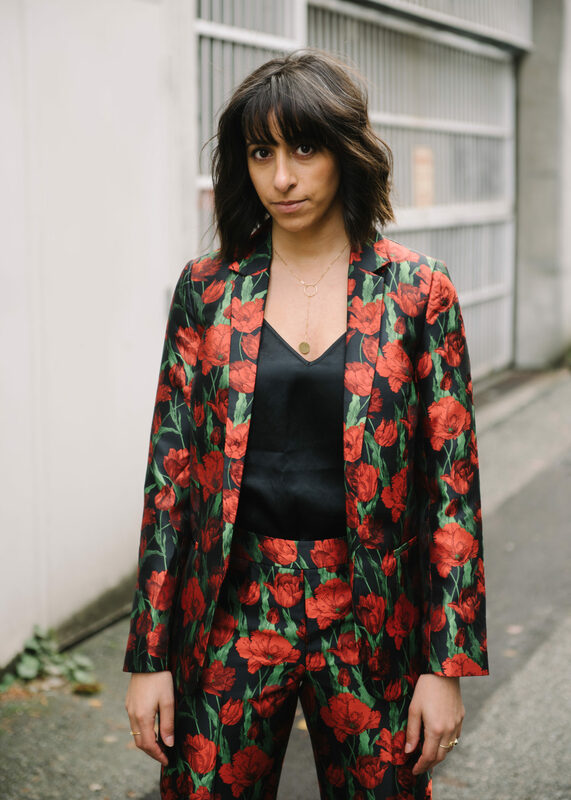 Park Royal is the only shopping centre to exclusively offer premier Canadian fashion retailer, La Maison Simons, where I snagged the perfect outfits for a fun night out with friends and more dressed up look with family. Luckily, they’re only about 15 minutes away from downtown so getting there is a cinch! I’m not one to get super formal but when there is an opportunity to get dressed up, I like to get creative! This is the perfect opportunity to have fun with your outfits if you’re more casual and classic for your day-to-day. No matter what you’re looking for, you can find your fun & dressy holiday outfits with Park Royal! Let’s scroll down to see what I’ve paired with the trusted help of my fashionable friend Joshua Langston and major bonus… it’s all on sale! PS. Park Royal is giving away a $250 gift card HERE and to top it off… I’m giving away $100 gift card! Check out my Instagram HERE for your chance to win. This can be a great chance to grab something from the in-house designed collection at Simons. 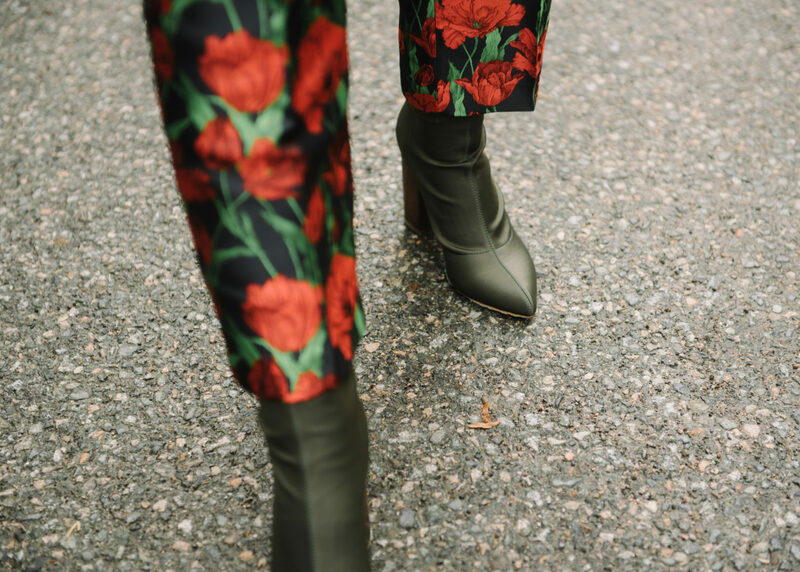 The moment Joshua and I landed eyes on this red floral pattern we knew we needed to incorporate it somehow. The fact that we found it as a full suit was just a bonus and dared to be a little extra this holiday season. You know me, I would have never worn this full suit in the past but my style is evolving and I couldn’t pass up the opportunity to dawn this number and totally commit to it. To compliment the black in the suit and mute the colours, we paired it with a basic silk camisole. This suit jacket does not close and in my opinion if you’re wearing something very full on like this pattern, you’ll want the middle portion (shirt) to be more basic. To take your eyes from top to bottom, we paired the suit with a green boot to compliment the green in the suit. The green boots also more muted as we wanted the suit to speak for the outfit! Initially, we passed this dress about 3 times before we picked it up. This is the perfect example of something that doesn’t speak well on the hanger but needs to be tried on. We decided to grab this dress as a trusted classic number that can work well for a party with friends or a more conversation work party but the moment I tried it on we kicked ourselves for not grabbing it to begin with. The front panel is detached from the dress and has the most beautiful flowy feature! Like I said, I like to have fun when I have the opportunity to dress up so let’s bring out the metallic boots! 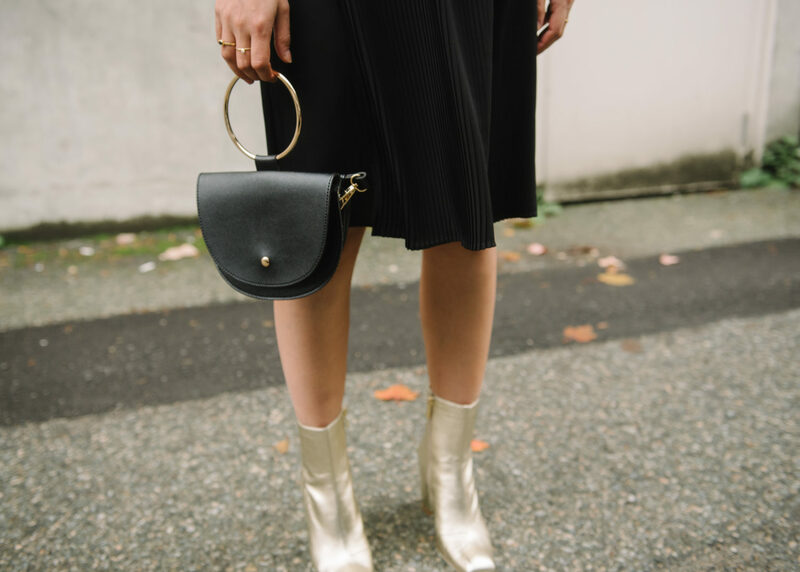 These boots are swoon worthy and the higher ankle makes my legs look longer and provide that fashion forward touch with a little black dress. We opted in for a more detailed and in-vogue clutch with gold accents to compliment the boots and jewelry. 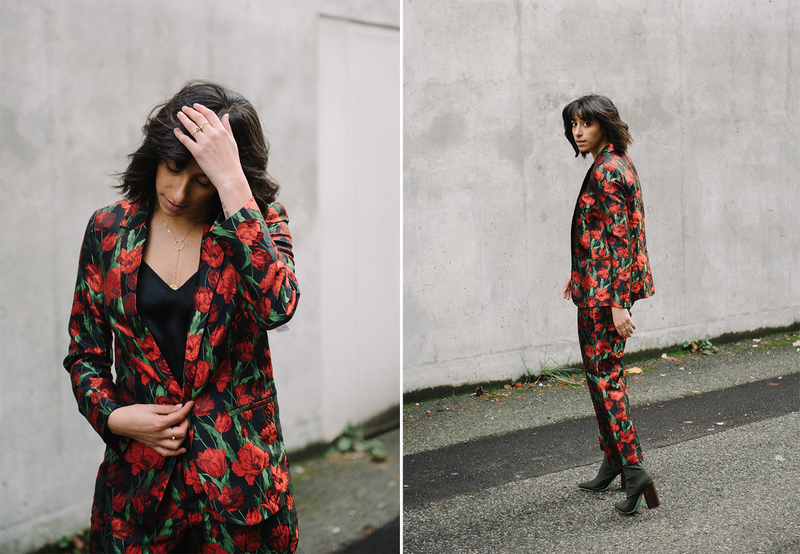 Next Post Ethically sourced fashion labels in Vancouver: FUHR co.